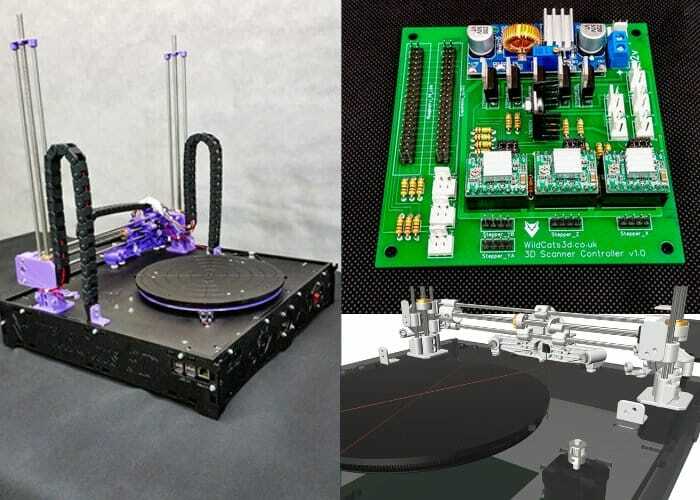 A new second-generation high resolution 3D scanner has been created by the development team and engineers at Wild Cats 3D based in the United Kingdom. Offering a Raspberry Pi powered system that is capable of creating high resolution scans of real-life objects at an affordable price. – On-board Processing Raspberry PI 3B+ (including wireless connectivity). – WildCats3D custom controller board. – Bed size 240mm diameter by 300mm height. – Unique pan and rotational scanning. – High resolution Raspberry PI camera v2 8 mega-pixel. – Use of blue / violet line lasers for better colour detection. – Robust modular chassis design. – Purchased or self printed parts (allowing for easy upgrades). – Full (Linux) Raspbian desktop. – Light-box cover to allow scanning in varied lighting environments. – Depth resolution of 0.05mm. – Pan resolution from 0.05mm. – Rotational from 0.1 degrees. For more details and a full list of all available pledge options jump over to the official crowdfunding campaign page currently underway on Kickstarter by following the link below.